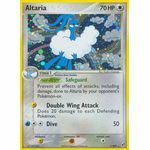 Poke-Body: Safeguard: Prevent all effects of attacks, including damage, done to Altaria by your opponent's Pokemon-ex. [L] Double Wing Attack: Does 20 Damage to each Defending Pokemon. 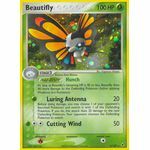 Poke-Body: Hunch: As long as Beautifly's remaining HP is 40 or less, Beautifly does 40 more damage to the Defending Pokemon (before applying Weakness and Resistance). [G] Luring Antenna: 20 damage. Before doing damage, you may choose 1 of your opponent's Benched Pokemon and switch it with 1 of the Defending Pokemon. If you do, this attack does 20 damage to the new Defending Pokemon. Your opponent chooses the Defending Pokemon to switch. [G][C][C] Cutting Wind: 50 damage. [C] Leaf Poison: 20 damage. 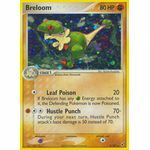 If Breloom has any [G] Energy attached to it, the Defending Pokemon is now Poisoned. [F][C][C] Hustle Punch: 70- damage. During your next turn, Hustle Punch attack's base damage is 50 instead of 70. 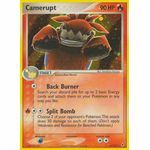 [C] Back Burner: Search your discard pile for up to 2 basic Energy cards and attach them to your Pokemon in any way you like. Poke-Power: Psychic Trance: Once during your turn (before you attack), if Claydol is your Active Pokemon, you may shuffle your hand into your deck. 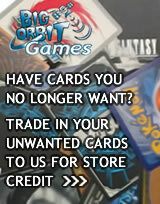 Then, draw a number of cards equal to the number of cards in your opponent's hand. This power can't be used if Claydol is affected by a Special Condition. [C][C] Ancient Mantra: 20+ damage. 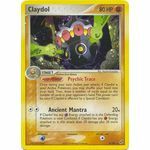 If Claydol has any [P] Energy attached to it, the Defending Pokemon is now Confused. If Claydol has any [F] Energy attached to it, this attack does 20 damage plus 20 more damage. 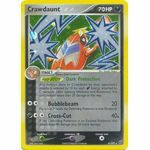 Poke-Body: Dark Protection: Any damage done to Crawdaunt by your opponent's attacks is reduced by 10 for each [D] Energy attached to Crawdaunt (after applying Weakness and Resistance). You can't reduce more than 20 damage in this way. [C][C] Bubblebeam: 20 damage. Flip a coin. If heads, the Defending Pokemon is now Paralyzed. 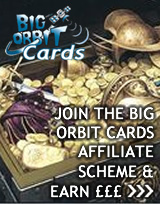 [D][C][C] Cross-Cut: 40+ damage. If the Defending Pokemon is an Evolved Pokemon, this attack does 40 damage plus 20 more damage.